Recently, Democrats received an e-mail from outgoing Democratic Finance Chair Bill Baldwin who stepped down to take on some campaign duties on a 2015 campaign. 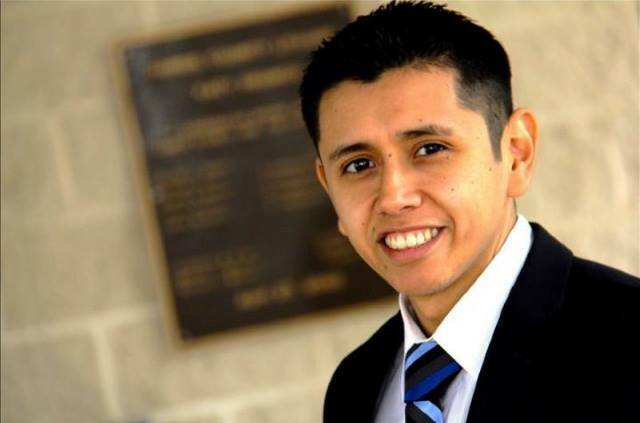 Today, Democrats received an e-mail from HCDP’s new Finance Chair, Luis Lopez. 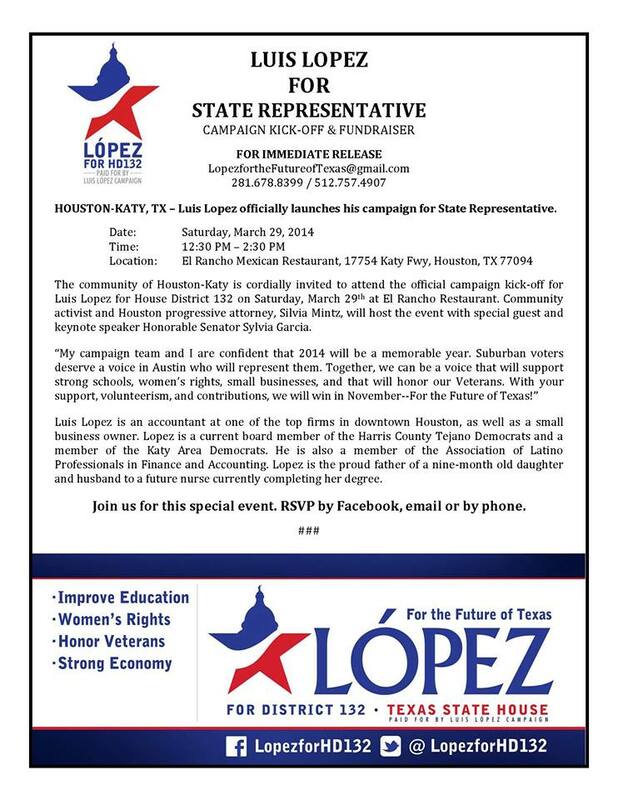 I’m sure you’ve seen him mentioned here on the DC, since I had the honor of helping Luis out as he repped Dems in the race for Texas House District 132. Luis ran a great campaign in a very red year, did some respectable fundraising in a year when Dems were mostly funding the top of the ballot, and, although the result wasn’t in his favor, Luis recommitted to serving his political party and his community. I’m always boasting that Luis is a force of nature, and he will not disappoint in his new role with the Party. Here’s his e-mail, if you didn’t receive it. Let’s support Luis’ efforts! I wanted to take a moment to introduce myself to you. My name is Luis Lopez and I was recently appointed as the new Chair of the Harris County Democratic Party’s Finance Committee. I could not be more excited to take on the role and the task of helping increase the financial security of our county party. Election after election we see that when we invest our time, our energy and our financial resources into the Harris County Democratic Party, we get real results. So, yes, I will be asking you to open your wallet and make a contribution in this email. The backbone of our Party is our sustaining membership program. What if I told you that it would take an additional 1,292 Harris County Democratic Party Sustaining Members just to match the MINIMUM donation of at least $5000.00 that 31 people have made to the Harris County Republican Party to become members of the Republican Party Cornerstone Club. I want to ask you to commit to becoming a sustaining member, renewing your sustaining membership, or even just making a donation of $20, $50, or $100 today. The Finance Committee is working on ways to keep the Party financially secure and raise the funds necessary to continue running programs throughout the year – but we cannot do it without you. We have a lot of work to do, so let’s get started! Unaccompanied minor. That was me. I arrived here with a coyote in order to reunite with my family. Today I reflect on it more than ever. Tomorrow I will visit unaccompanied minors whose parents had the same dreams as mine – to give their children an opportunity for a better life. Every challenge is an opportunity for leadership to make decisions that will save, shape and stand up for the future of these children. The positive energy to support the unaccompanied minors in the county is amazing. Obviously, this issue hits close to Lopez’s heart, having experienced what some of these child refugees have experienced. While his Tea Party opponent has been sounding the “secure the border” alarm, Luis Lopez has been seeking out the truth about the border, the child refugees, and solutions to move Texas forward regarding public safety, education, and health care for all Texans. I’m glad Luis Lopez is in our corner. Visit his Facebook page and stay tuned for more reports from Luis Lopez. There are a couple of races that this blogger will keep an eye on and both are in the ‘burbs. Educator Amy Perez is running for Texas House District 150 with the intent to end the political career of Debbie Riddle, while Luis Lopez is running for the open seat for Texas House District 132. Amy Perez, a highly recognized educator, has assembled quite a campaign team for her race for HD 150 and has earned some media attention during the last couple of weeks, including in the paper that probably lands on Debbie Riddle’s yard. She has begun to make the rounds all over District 150 and is getting even more attention on Facebook. Equally active is the candidate for HD-132, Luis Lopez, who has quickly amassed over 700 “likes” on Facebook, outdoing three of the Tea Party candidates, and on the heels of another. The accountant from Katy has also assembled a campaign team which has hit the ground running and has been making the rounds. Both teams are running impressive grassroots campaigns and need all the help they can get from inside and outside of the district. Debbie Riddle is quickly wearing out her welcome in her district as she continues to attack poor children and public education, while HD-132 provides an opportunity for change as an open seat. As the suburbs become more diverse, there is a need for representatives who recognize that diversity and will be representative of that diversity, especially on issues of education, public safety, and economic development. Follow their campaigns on Facebook for the latest. Best of luck to Amy and Luis.